I personally don’t think this film is up to par with the previous trilogy. If you’re a purist, you’re probably going to have issues with it. A few things were changed and moved around, as always, but it seemed like more than normal to me. Then again it has been about four years since I read the book, and I don’t remember much of it. (So don’t take my word to mean it’s horrible) For the most part I liked it, but honestly, it didn’t really hold my attention. The main problem my fiancée had with the film was that he felt he was in a green screen the whole time, and not in an actual world. And I have to agree. It wasn’t a question of scenery, the setting was gorgeous; it was the villains. Every orc and goblin in the Lord of the Rings trilogy was a person in make-up and costume that cemented the “realism” of this world. The cave trolls and warg riders were of course, CGI, but they were done well enough to appear real. In The Hobbit every orc and goblin was a little more obviously computer generated, and it took me out of the film experience. Not only were the previous adaptations actual made up people, but they had voices that matched; either a gravelly or nasally voice depending on the character. The Great Goblin here had a normal, booming voice of someone you’d meet on the street, and it bothered me because I didn’t buy it for a second. I didn’t buy the main orc, I didn’t buy the wargs; to me it looked like they rushed to pull this together in the special effects department, and as a result I am rather disappointed. Hands down the best part of the whole movie was meeting Smeagol/Gollum in the cave. Smeagol was adorable wanting to play the game, and Gollum was as menacing as ever. We’ve always seen him as two separate characters, each with a different camera angle so that it appears as though they really are two physical beings talking to each other; one wide-eyed, innocent, and eager to please, the other narrow-eyed, snarling, and plotting his upper hand. Here, they didn’t use that technique, so we as an audience can see his transitioning between the two halves of himself. I like that didn’t use the same way to portray the two of them; it takes too long if he’s not having a full blown conversation with himself. 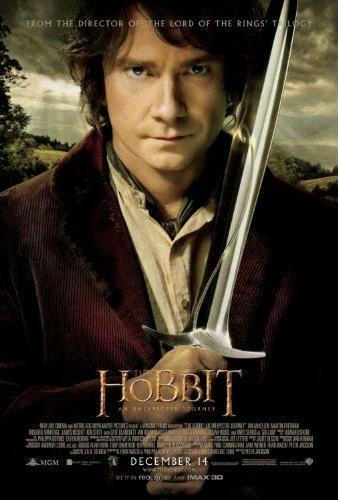 It also makes it easier to believe that Bilbo took pity on him. My only other issue is how Biblo found the ring. In my opinion, if you’re going to touch on something in little to no detail in one piece of work, and then revisit it at length in another piece of work, the two scenes should match. They portrayed it in The Lord of the Rings as Bilbo placed his hand on the ring while crawling along in the cave, had to keep moving, and absentmindedly put it in his pocket. Whereas in The Hobbit he stood up, saw it, picked it up, put it in his pocket and walked off. The second scenario loses the impact of finding the ring, as well as Bilbo’s curiosity when he rediscovers the ring in his pocket during the game of riddles. Considering this is the most pivotal scene to both works of literature, they could have treated it with a little more wonder. Despite all that, I loved the characters. I liked all the dwarves, even though I have no idea who they are individually, and only recognize about three of them by sight. I’m not sure how I feel on some of their make-ups, but for the most part the characters were done fairly well. The congregation meeting at Biblo’s house was great. Watching Bilbo fret over this horde of dwarves nearly ransacking his house was awesome. I loved seeing the familiar characters come back. I didn’t expect all of them. I didn’t like the wigs on Older Bilbo and Frodo at all. They seemed too long. I’ll go see the next two films, but if this just turns out to be nothing but all CGI, I’m not likely to own it on DVD. And yes, they’re stretching this into three films. This entry was posted in action/adventure, fantasy, PG-13 and tagged 2012, Andy Serkis, book, Cate Blanchett, Christopher Lee, dwarves, Elijah Wood, elves, Hugo Weaving, Ian Holm, Ian McKellen, Lee Pace, magic, wizards. Bookmark the permalink.